Before running test cases, make sure all test devices (Golden and DUT) are attached to the Windows machine with the installed GRL Test Harness and Harness Automation Tool. Warning: For all manual test cases, you MUST reset the DUT manually with the factoryreset CLI command. This ensures all network information stored from the prior test case is erased. Select test cases as desired, then click the green play button to execute. 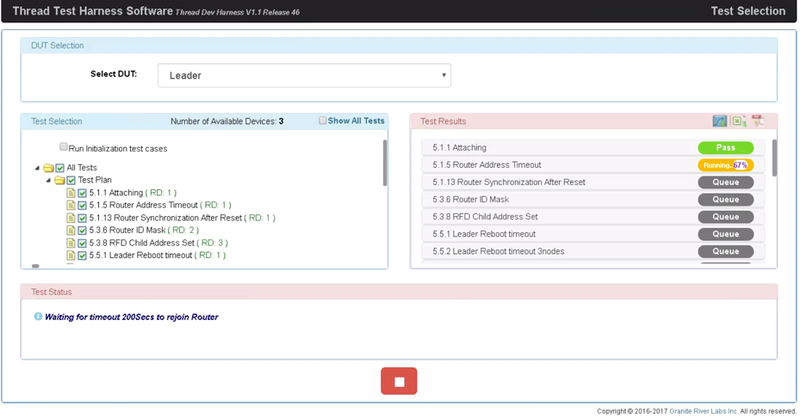 Note: For detailed instructions on how to run test cases in the Test Harness, see the Test Harness Quick Start guide included with the software. The Test Harness prompts the user for manual input during some test cases. Note: The Mesh-Local Prefix is automatically configured as fd00:0db8::/64 once the extpanid is configured. For test cases in Section 8 of the Test Plan, configure the Commissioner role. The eui64 is the factory-assigned IEEE EUI-64 identifier, obtained via the eui64 CLI command. THREADJPAKETEST is the Joiner Credential, which is used to generate the Pre-Shared Key for the Device (PSKd). The Joiner is removed from steering data after the configured timeout. We recommend using 500 as the timeout value during the 8.2.x Commissioner test cases. For a list of all CLI commands, see the OpenThread CLI Reference. During Thread Certification testing, mixed test beds featuring reference stacks from ARM, NXP, Silicon Labs, and OpenThread are used. Test bed topologies are defined in the C:\GRL\Thread1.1\Thread_Harness\TestScripts\TopologyConfig.txt file. To enable device selection in order to perform a test case with the same exact reference platforms as the Thread Group's ATL would, set the EnableDeviceSelection parameter in TopologyConfig.txt to True. Note: This feature requires you have the requisite hardware physically on hand. See the Thread Certification Test Plan for more information. Start the Test Harness with only the NXP Sniffer attached to the Windows machine. This avoids device auto discovery by the Test Harness. Plug in the test devices one by one and note their corresponding serial port. Clear the Test Bed section of any existing devices. Drag the appropriate devices for the specific test case topology from the Supported Hardware section on the left to the Test Bed section on the right. Make sure to drag them in the reverse order of the final sort order. For example, for test case 9.2.9, drag the Leader first, then Router1 second, and so on. If you drag the wrong device, clear the devices in the Test Bed section and start again. In the Test Bed section, fill in the serial number or IP information for each device in the final sort order. For example, for test case 9.2.9, after dragging, the first device is Router2, the second is Commissioner, and so on. The final sort order is important, as it's based on the role assignment sequence in each test case. The test case will fail if the devices are not configured in the Test Bed section in the correct order. Select the Set as DUT radio button for the DUT. Select Connect All to initiate device discovery. Execute the test case (9.2.9 or 9.2.10). Shield and unshield each group of devices as prompted by the Test Harness.